Dress casually at this legendary indoor-outdoor restaurant, as you’re sure to get messy eating big, briny oysters straight out of the Salin de l'île Saint-Martin salt marsh that stretches before you, its waters tinted with the algae that turns shrimp (and migrating flamingoes) pink. 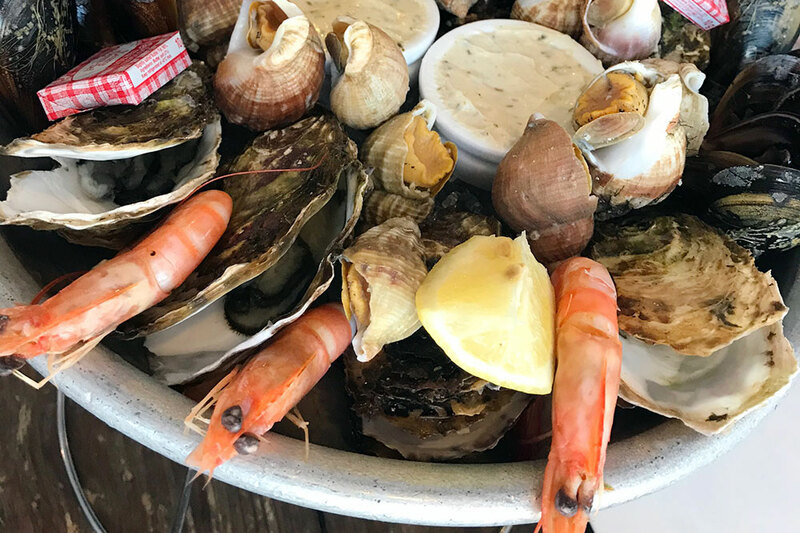 Steamed, these crustaceans are truly delectable, as are razor clams and cuttlefish doused in persillade; whelks dunked in garlicky aioli; salt-encrusted whole sea bass; and huge seasonal langoustines. Come early and get a tour of the fleur de sel production in an area where they’ve been harvesting salt since Roman times. Then sit at a communal table and dig into whatever the boats have brought in, accompanied by Languedoc’s minerally white wines. Yes, you can get seafood all along the coast, but none as fresh, well-prepared or served in as unique a setting. For dessert, try “tiramisel,” a riff on tiramisu made with a deliciously saline caramel. Daily May–September, limited hours October–April. Reservations recommended. US$75. Lunch is especially lovely beneath the tall trees on the terrace overlooking the placid Lez River. But even inside, Montpellier’s oldest restaurant, dating from 1835, feels fresh and chic, with spare stucco walls and driftwood fixtures. The lack of fuss in chef Charles Fontés’ Michelin-starred cooking lets the Languedoc ingredients shine. In spring, a gazpacho amuse-bouche buzzes with tomatoey zing. 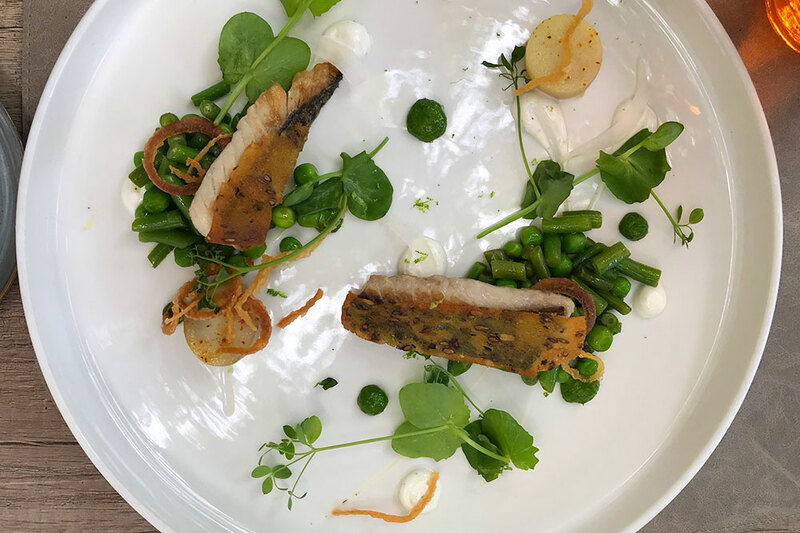 Fillets of mackerel, their skins sheathed in a bronzed crust, sit atop peas and shoots, watercress and haricots verts, dotted with dabs of pea cream and purée. Beneath sealike foam hide sweet, grilled shrimp and squid, tossed with fresh, egg-yellow pasta. Duck breast, grilled to just-pink, partners with whipped sweet potato and candied peaches, creating a yin-yang of seasons and sweet-savory flavors. Dessert is more global: tiny parfaits of apricots and cinammony tonka beans; passion-fruit parfait dotted with chocolate and hazelnuts. Closed Mondays. Reservations recommended. Set menus US$47 to US$185; à la carte US$100 before drinks. Frogs serenade diners on the garden patio at the gracious Domaine d’Auriac, a few minutes away from the UNESCO World Heritage site of La Cité, the medieval citadel of Carcassonne. 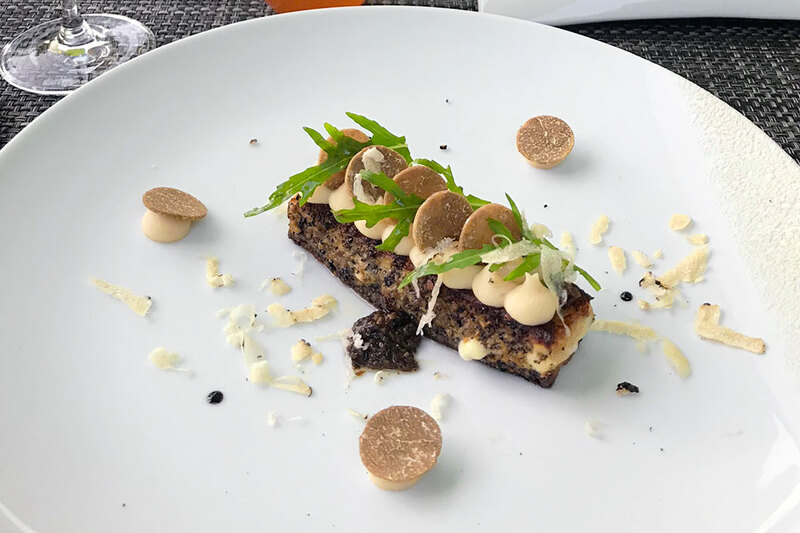 Chef Philippe Deschamps’ Michelin-starred regional cuisine showcases pungent cured anchovies from nearby Collioure in a petite pissaladière (carmelized onion tart). 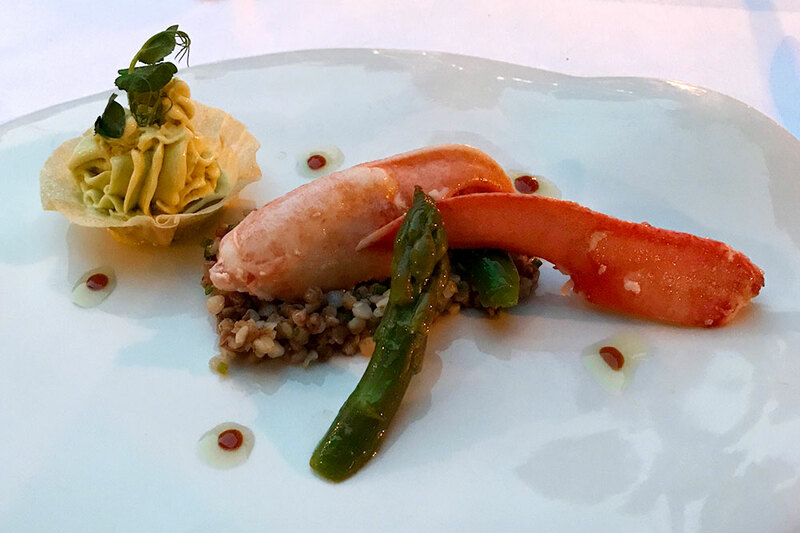 The glistening claws of blue lobster are paired with a vibrant asparagus ice cream. And tender veal sweetbreads tucked amid baby artichokes, chanterelles and jewel-size turnips come in a sauce spiced with local saffron. In cold weather, order the house version of a local specialty, cassoulet. You could end with a Grand Marnier soufflé, but the pièce de résistance is a board of regional Occitane cheeses, aged on site. Mushroomy Colombier, butterscotchy Bethmale from the Pyrenees, and rich salty Roquefort are even better when washed down with a local organic Syrah. Reservations recommended. Set menus US$50 to US$125; à la carte US$115 before drinks. 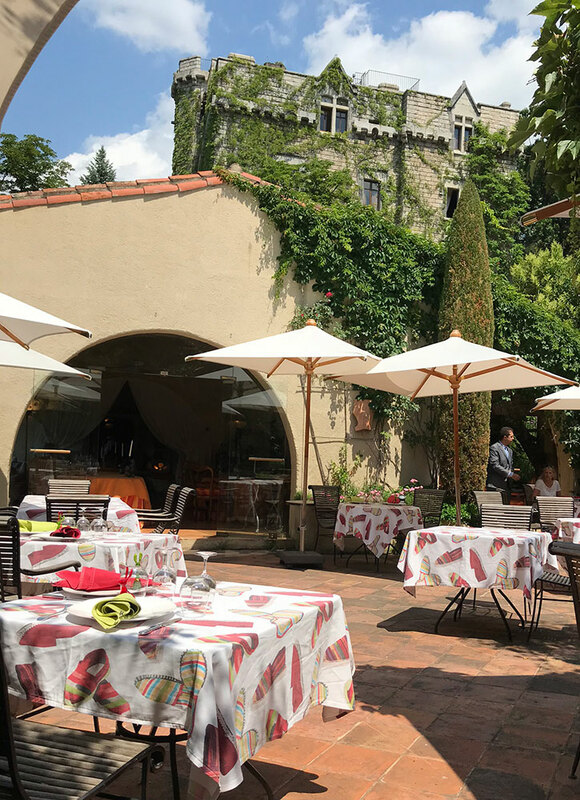 Chef Putelat pulls out all the two-star Michelin stops at this contemporary treat in ancient Carcassone. 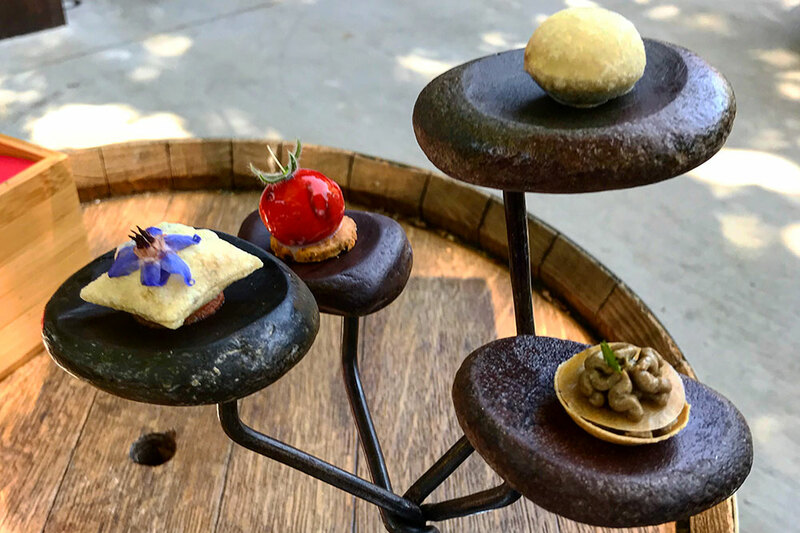 The amuse-bouches — among them a ravioli of black garlic and anchovy, and a smoky foie gras-and-artichoke mousse — set off tiny explosions of flavor. Staff don a black glove to shave summer truffles over a tartine in the guise of a forest log, stuffed with mozzarella and local white beans and rolled in black truffles. 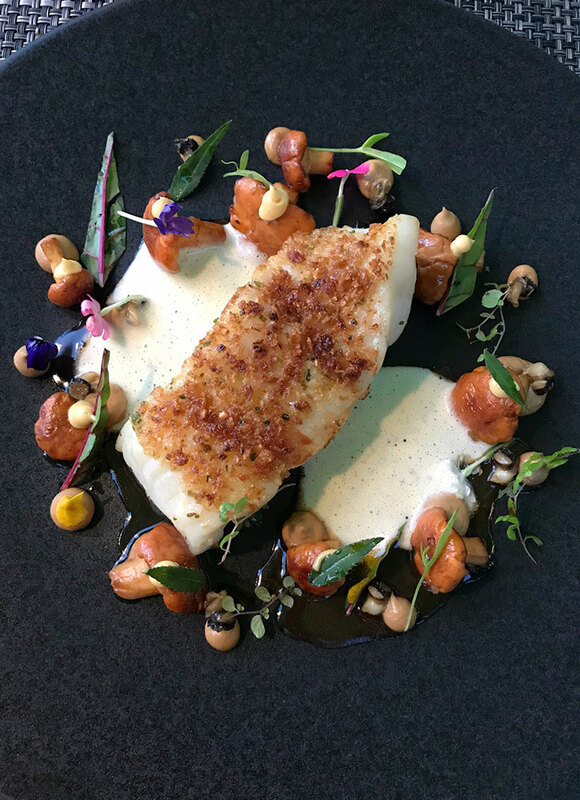 A turbot fillet enrobed in herbed breadcrumbs looks heavy but is flaky and moist, and arrives with cep mushrooms, little periwinkles and dots of lemon asparagus cream. This chef likes his carbs: a dark and deep chocolate tart is 86 percent cacao, while his signature dish is a waffle with Suzette sauce and orange-blossom ice cream. Bonbons follow, but not before the clown car of cheese carts, rambunctious aromas cartwheeling out of every open drawer. Reservations required. Set menus US$100 to US$195; à la carte US$125 before drinks. Chef Gilles Goujon’s three Michelin stars have put the tiny commune of Fontjoncouse on the map, but fortunately they have not dulled his joie de vivre. His cooking, while high art, remains rootsy and even comical. In cozy, blond-wood rooms, guests are invited to wield a mallet to crack a sugar “pearl.” Smoke wafts out, mingling with seawater gelée and raw oyster. A waiter slices a crusty loaf to reveal a lily-white onion within. He serves it warm atop a cardamom-scented fricassée of baby lettuces, peas and, improbably, strawberries. Dig into a local farmer’s egg and out spills black truffle jus. Lavished with mushroom cream and more truffles, with warm mushroom milk on the side, this is just one of the chef’s paeans to fungi. He also stuffs morels with shrimp paste and pairs them with asparagus and a ravioli of Corsican sheep’s cheese. And he fills a vol-au-vent with wild mushrooms, sauced in oxidized wine, on a plate of rabbit and goat offal. Dessert, too, celebrates the homespun. A shiny sugar lemon encloses citric sorbet, thyme-flower cream, lemon curd and kumquat purée. “Just like grandmother’s lemon merengue pie,” says the server, though few of our forebears ever cooked like this. Reservations required. Set menus: US$115 to US$205; à la carte US$180 before drinks. A blue-and-white interior frames panoramic ocean views at this dramatic location next to the Phare du Cap Leucate lighthouse. Judging by the originality of his cooking, chef Erwan Houssin is gunning for a second Michelin star. He employs Japanese touches: a shrimp tartare lollipop over toasted sesame seeds; butter blended with yuzu; an enormous oyster bathed in cucumber juice. Fennel — raw, cooked and foamed — sweetens spider crab meat, while wasabi-flavored flying fish eggs lend heat and texture. Crunchy sea beans and a dusting of dried seaweed bring umami oomph to line-caught loup de mer, sided by a spinach, broccoli and parsley purée garnished with baby Swiss chard. Full-flavored pigeon breast is dressed in a sauce made with herbs foraged right outside the window. Fairy-tale desserts include a cherry soufflé with a basil-and-fresh cheese sorbet to abet its spell. 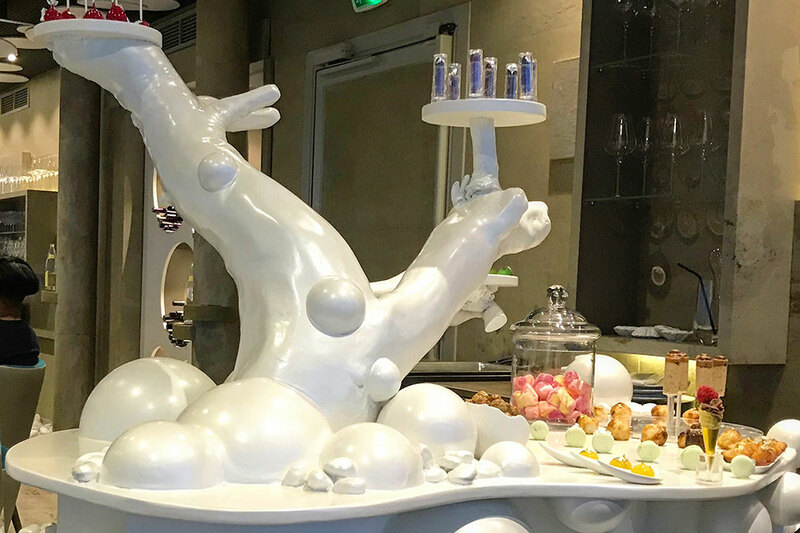 But the showstopper is the mignardise cart, a fantastical, rolling sculpture that looks like it’s part sea nymph, part coral reef. A server dives for your treasures — coffee-strachiatella mousse push pops; banana, ginger and citron gold-leaf pearls — each more precious than the last. Reservations required. Set menus US$55 to US$90; à la carte $130. After so many meals drenched in rich sauces, one can yearn for simpler fare. The restaurant at this gorgeous Pyrenees thermal resort delivers. Chef Sébastien Nouveau is a disciple of Michel Guérard’s slimming cuisine minceur, which he prepares upon request. But all of his cooking is fresh and elemental. 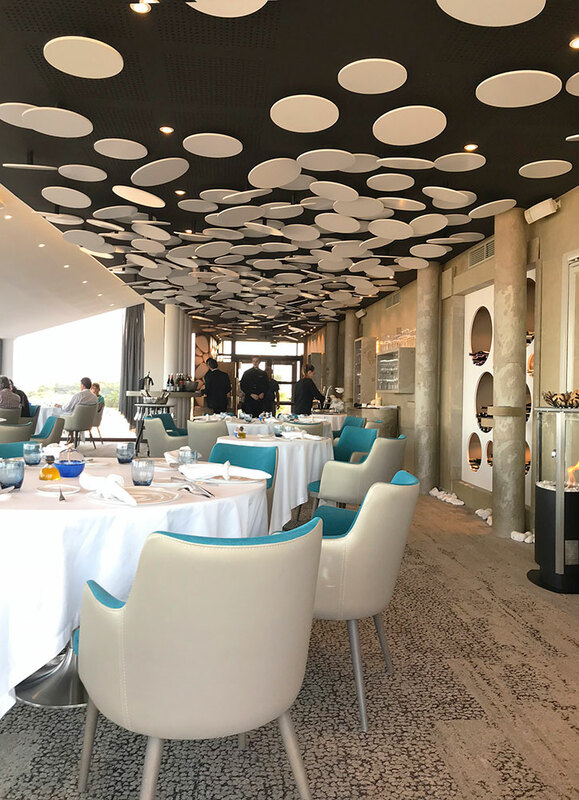 If you’ve partaken of the spa’s white mud bath or plankton facial, afterward you might just want a salad, which can be hard to find on haute French menus. Here, diverse greens, julienned vegetables, Parmesan, shredded chicken, dried acacia flowers, lacy croutons and a garlicky cream dressing make for a monumental lunch. At dinner, Mediterranean sashimi comes dressed en saor, in a sweet-sour sauce of pickled onion, accompanied by a medley of shaved raw beets and baby zucchini, radicchio and rocket. Nouveau likes live fire. He gives succulent, local Tirabuxo pork a good charring, then bolsters its jus not with cream but with capers to create a balance of sweet, savory and bitter flavors. For dessert, opt for the apricot tart tatin. Loaded with fruit and piping-hot, vanilla-bean ice cream pooling on top, it’s proof that even a spa restaurant can allow you to indulge. Reservations recommended. Set menus US$ to US$85; à la carte $100 before drinks.